The CSPDC administers a Bicycle and Pedestrian Program that operates through the Harrisonburg-Rockingham and Staunton-Augusta-Waynesboro Metropolitan Planning Organizations as well as the Rural Transportation Program. The Program assists in the planning, programming, construction, and marketing of the Region’s bicycle and pedestrian resources. Under the program, CSPDC staff provides support to our localities with the goal of ensuring that there is ongoing support, coordination, and implementation of local and regional bicycle, greenway, pedestrian, and trail plans. The program is funded through a combination of federal, state, and local resources, dependent on the activity. Regional Bicycle and Pedestrian Program Administration. The Central Shenandoah Planning District Commission (CSPDC) administers the regional bicycle and pedestrian program, provides staff support to local and regional committees and working groups, and ensures that the elements of federal, state, local, and regional plans and directives are fulfilled. Bicycle/Pedestrian Program Support. The CSPDC works with organizations in the Region whose activities or mission play a role in building support for bicycle/pedestrian programs, i.e. parks and recreational organizations, economic development and tourism departments, schools, cycling and trail organizations, and many more. Program Funding. The CSPDC aggressively pursues state and federal funds to further bicycle/pedestrian programs in the Region, such as the Transportation Alternatives Program (including the Safe Routes to School and Enhancement programs), and the Department of Conservation and Recreation’s (DCR) Recreational Trails Program grants. Networks, Maps, Directions and Safety Guidelines. The CSPDC identifies and develops bicycle route networks, and provides maps and turn-by-turn directions for bicycle routes in the Central Shenandoah Valley Region. Bicycle safety issues are also addressed throughout the Region, with guidelines made available to the public. To view and download these materials, please visit www.bikethevalley.org. Bicycle Tourism. The CSPDC has established a strategy to improve the coordination of programs that specifically encourage bicycle tourism, such as identifying and evaluating bicycle touring routes, and developing guides for bicycle touring. Technical Assistance for Local Projects. The CSPDC provides support and technical assistance for local projects and programs that relate and enhance the regional bicycle/pedestrian vision. Education. CSPDC staff makes presentations and disseminates information and materials at community events, civic group meetings and other public meetings regarding bicycle and pedestrian programs. Harrisonburg-Rockingham MPO Bike-Ped Plan. The CSPDC is facilitating the development of a Harrisonburg-Rockingham Metropolitan Planning Organization Bicycle and Pedestrian Plan. The Plan will provide a framework for the development of an efficient, safe, and interconnected system of pedestrian, bicycle, and multi-use facilities to enhance the transportation system of the Region. The Bicycle and Pedestrian Plan will identify needed improvements for bicyclists and pedestrians and make recommendations for bike lanes, shared-use paths, sidewalks, and intersection/crosswalk safety upgrades. Economic Impact Analysis of Bicycle Tourism. The CSPDC conducted a “Bicycling in the Shenandoah Valley” Economic Impact Analysis (EIA) in conjunction with regional partners in 2015. The study measured multiple levels of impact that cycling has within the Shenandoah Valley Region, particularly on local retail, lodging and restaurant businesses, and provides a basis for planning future bicycle tourism marketing to achieve the most positive economic effect possible. Central Shenandoah Regional Bicycle Plan. 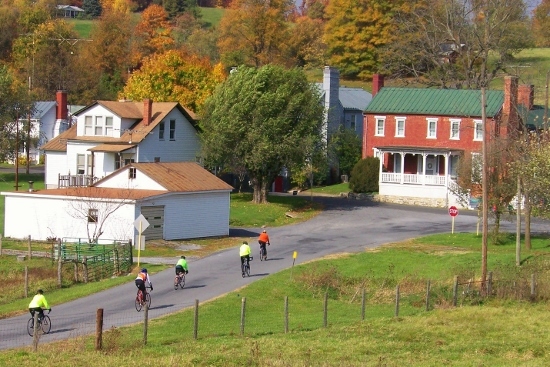 The Central Shenandoah Valley Bicycle Plan was developed by the CSPDC and adopted by local jurisdictions in 2005. It identifies and recommends appropriate bicycle facilities for key roadways in the Region including bike lanes, shared lanes, and expanded shoulders as well as separated bike paths. The Plan also makes recommendations for signage, bicycle maps, brochures, education and safety-conscious initiatives. The Plan creates a comprehensive network of cycling facilities connecting neighborhoods, communities, and key destination points. Central Shenandoah Greenways Plan. An inventory and natural resource assessment of the Central Shenandoah Region was completed by the CSPDC in 2004. It was financed in part through a planning grant from the Virginia Department of Transportation’s Rural Transportation Planning Grant Program and can be viewed HERE. Brushy Blue Greenways Plan. The Brushy Blue Master Plan completed by the CSPDC in 2004 proposes a 16.5 mile trail running from Brushy Hill Preserve, through Lexington, Rockbridge County, and Buena Vista, then eventually connecting to the Blue Ridge Parkway. Bike-Walk Summit. A CSPDC staff representative assists with planning of the annual Harrisonburg and Rockingham Bike-Walk Summit. Bike the Valley Website. The Bike the Valley website is a project of the CSPDC, featuring routes, resources, safety tips and event information. Safe Routes to School Projects. The CSPDC assists with grant writing and administration of local Safe Routes to School projects. Bicycle and Pedestrian Safety/Encouragement Campaigns. 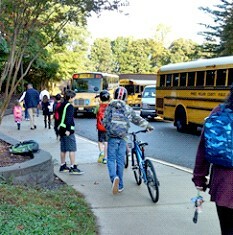 Bike to Work Day, Walk to School Day and Sharing the Road in Virginia are just a few of the bike-ped awareness events that the CSPDC actively sponsors and promotes throughout the Region.